Sweeping Machine mounted on Tractor. Hydraulic Sweeping Machine with dust collector. Mode Of Operation :- An Back Side Attachment Of Tractor. Sweeping Width :- 2100 Mm. Sweeping Speed :- 7 To 15 Km/Hr. - Automatic main brush control. - Easy to use control panel. 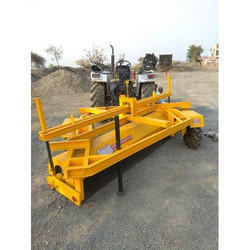 Waste Hopper Capacity: 220 Lt.
Leveraging on our experience, we provide superior quality of Scraper Sweeper. This product is designed and developed using superior quality raw material as per the set industry norms under the guidance of skilled professionals. The offered range is available in different specifications to meet the exact needs of the clients. A very effective machine to sweep road prior to tack coating. Drive is through the PTO of the tractor and tractor hydraulics are used to lift and lower the machine on the surface to be swept. Standard sweeping width is 2.135 mtr. 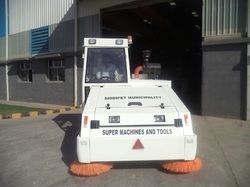 We offer a wide range of sweepers from mannual to ride on versions.